Brothers James and Thom Elliot have spent the last couple of years obsessing over the art of making the perfect pizza. They travelled to Naples to learn the trade with some of the best chefs in the city and on their return made a big name for themselves in the street food scene. Their pizza making van is still to be found in Soho’s Berwick St market and it has provided them with the ideal location to perfect their craft. A couple of weeks ago they opened up their first restaurant in Dean St, rather cheekily positioned opposite the long established Pizza Express jazz club. They have invested in a new dough mixer and built themselves a gas fired oven. I have been a couple of times. Once on my own when remarkably I walked away with a takeaway in a record-breaking 5 minutes (I had a gig to get to) despite the joint being busy. The second time, even though there was a queue, La Hedonista and I were seated immediately. This may have been more down to a level of post-opening disorganisation rather than my table hustling ability. The menu is simple. A handful of simple starters such as Fennel grissini with prosciutto and olive oil (£6), panzanella (£5) and olives (£3), ten pizzas, and a few desserts. They have Birra Moretti on tap (£4.50) alongside their house white, red and prosecco, and with a few classic Italian aperitifs (Aperol Spritz and Negroni) and coffee that’s about it. The upstairs is small and cramped but there is more comfortable seating downstairs. But we were here for the pizzas. The artichoke, ricotta and smoked garlic oil pizza (£9) was perfect. 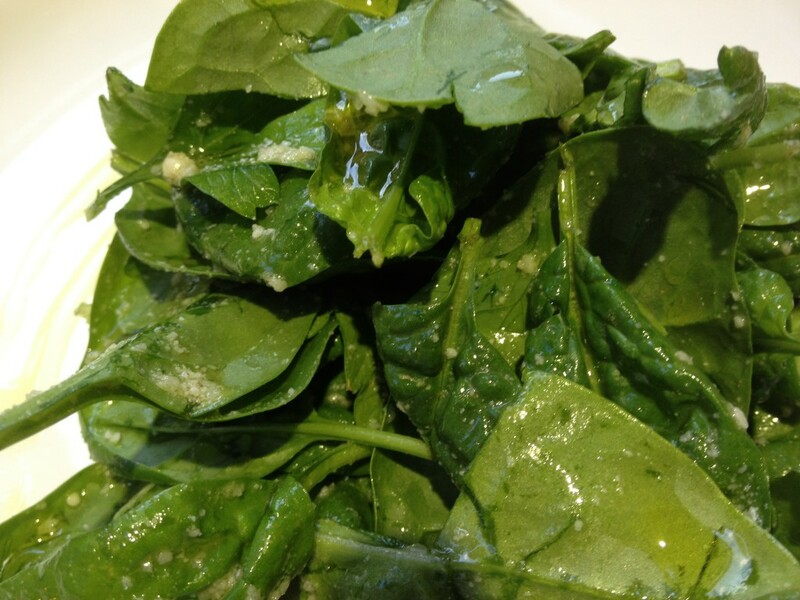 Built on a margherita base there was plenty of topping and the base was charred as it should be, chewy and delicious. 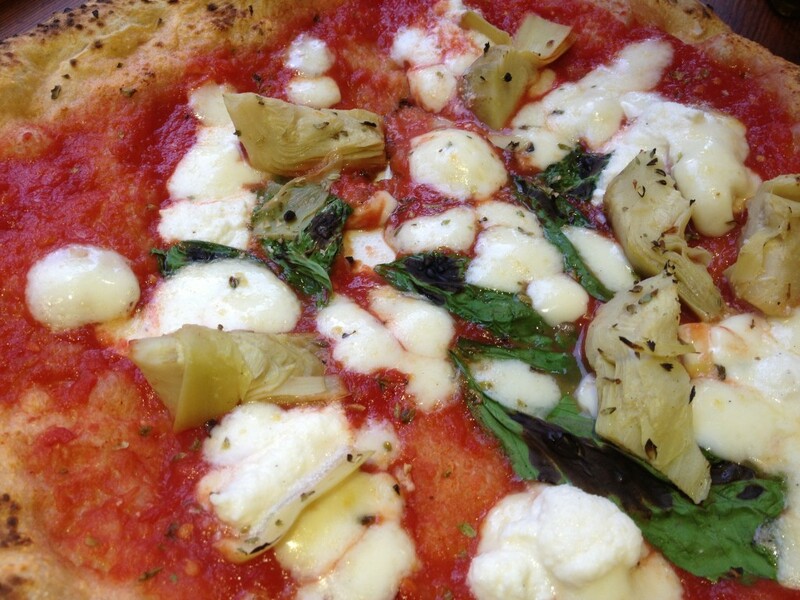 They use the best San Marzano tomatoes gently broken up rather than chopped for additional sweetness. 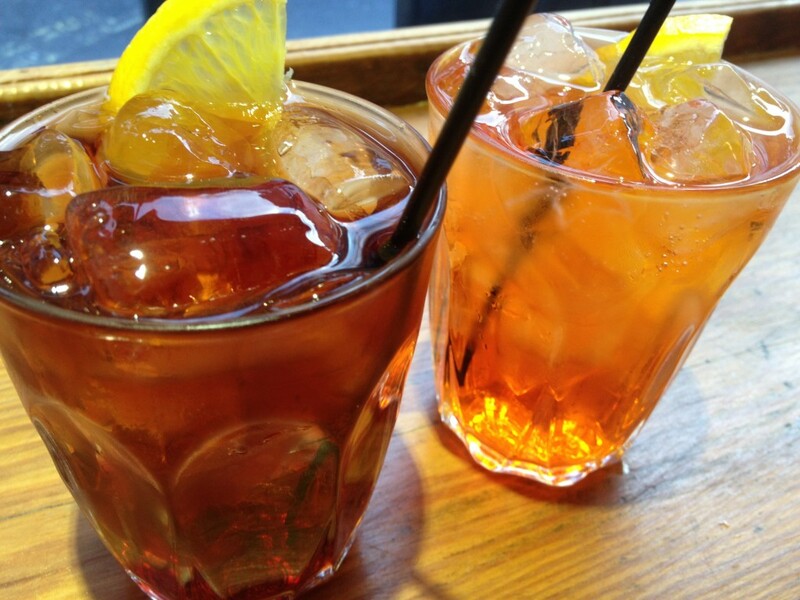 I was drinking a well-made Negroni (£6) and La Hedonista was quaffing this summer’s top drink an Aperol Spritz (£6). 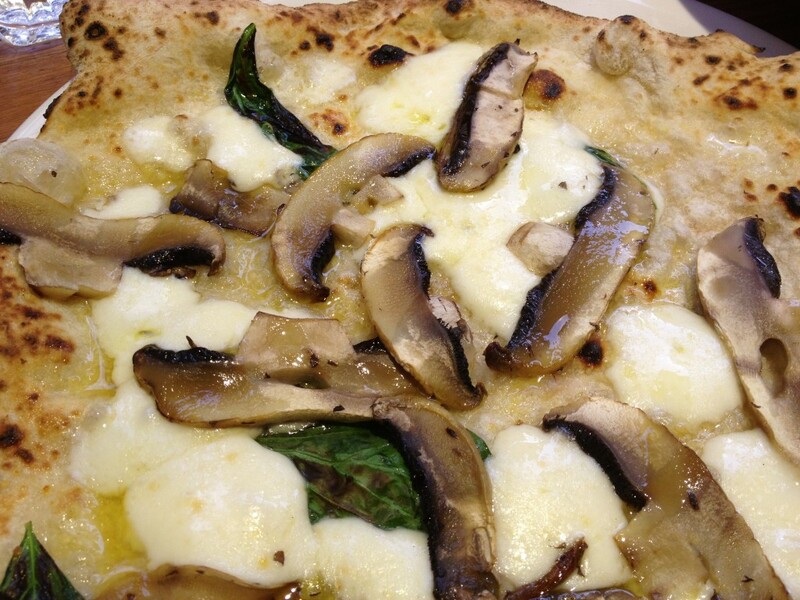 The portobello mushroom and truffle pizza (£10) was a classic pizza bianco with no tomato. Again it had a great crust and base and the Fior di Latte cheese (mozzarella made with cow’s milk) worked really well with the mushrooms and truffle oil. 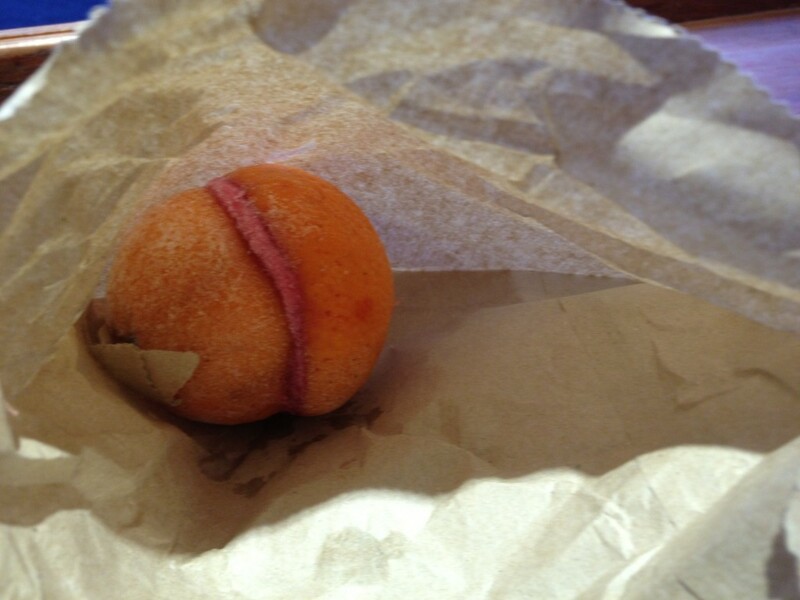 A Berwick St market salad (£3) was fresh and well-dressed (a bit like me…) and for dessert we had a blood orange sorbet (£4.50) which was rather fetchingly served within the blood orange. The Pizza Pilgrims’ Ices come from Gelupo in Archer St and are impeccable. 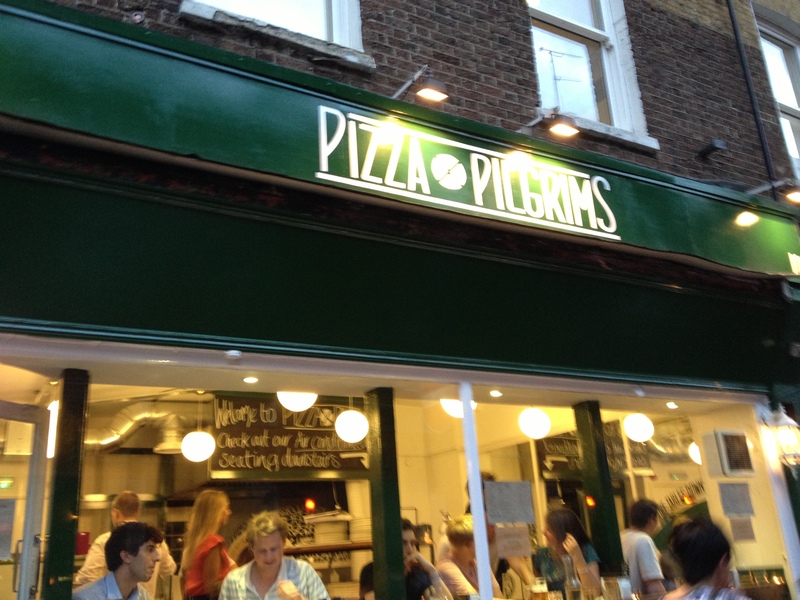 If you are looking for a buzzy on-trend place doing great pizzas in Soho then go to Pizza Pilgrims. 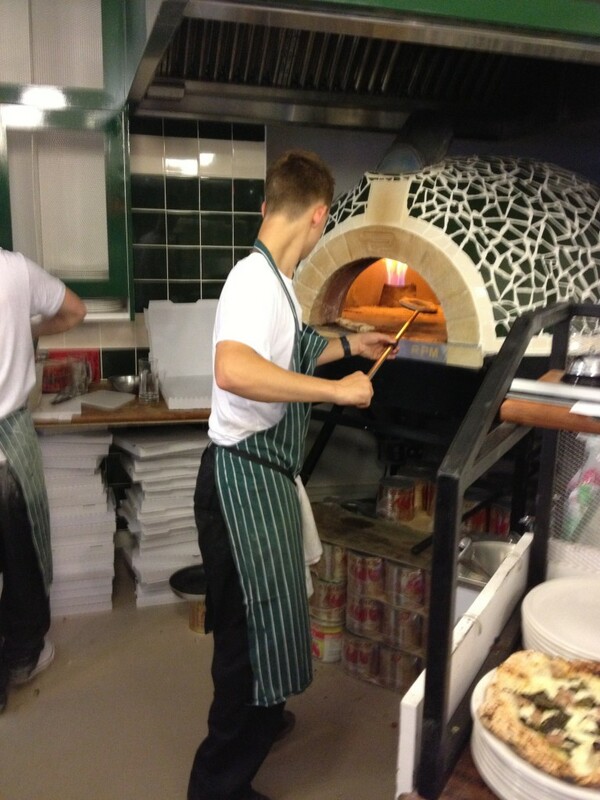 They don’t take bookings but if you don’t mind waiting and getting intimate with the other punters, then it’s fun to watch the chefs flaming the pizzas to get that perfect char whilst having an aperitivo or six.